NEW YORK -- The NYC Pride March was extra special for two FDNY EMTs. 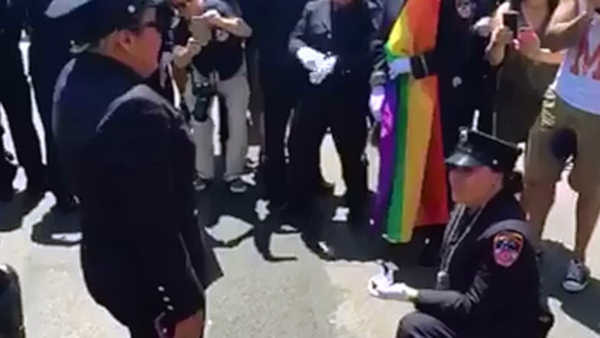 The FDNY posted a video on Facebook Sunday of EMT Julianna Arroyo from Station 20 in the Bronx, proposing to now-fiancee, FDNY EMT Erika Marrero. "The parade is really monumental for us because of the Orlando shooting. It hit really close to home," Arroyo said, "We wanted to walk in the parade in honor of the 49 victims. At the same time, I wanted to give Erika something positive to remember from the parade." The FDNY says Arroyo proposed to Marrero with the help of some family members.